Omari The Animator: Big Bang! Today I began working with some of the MA Broadcasting students on soem news graphics. They are in need of better graphics an well as a house style. I have also been experimenting with some After Effects Plugins and compositing. 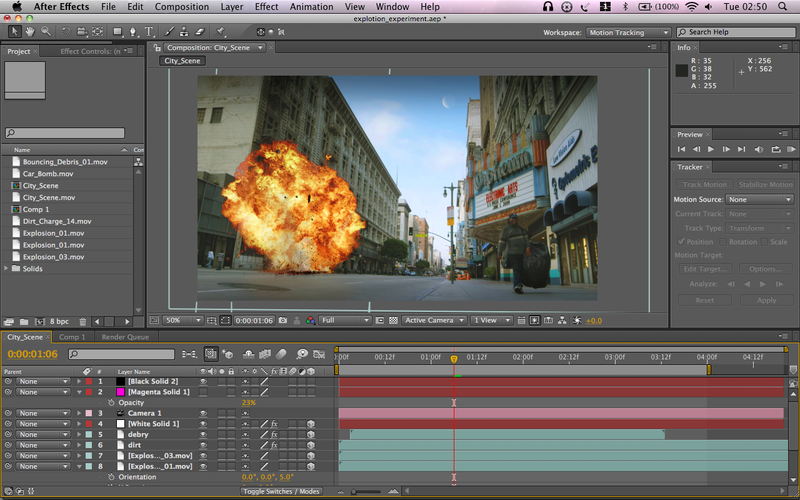 Below is one of my attempts at visual effects in After Effects CS4. It was made using a short video clip. The camera does not actually move, I have just made good use of the 3D camera tool and space within the software. Action Essentials 2, compositing their pre-keyed special effects carefully I have created this. (Although the chap with the bin bag looks a little suspicious). I was going to add some camera shake but I find the 'wiggle tool' in After Effects can look a bit fake. Explosion Test from Omari McCarthy on Vimeo.